You bought this classic style a few years ago for its lengthening effect. Option 1 (left picture): Pair a high-waisted skirt with a voluminous top that hits mid-thigh or above to instantly slim your lower half. Tip A flared top hides belly bulge. Option 2 (right picture): A higher waist allows you to rock a crop top without showing a glimpse of skin. Tip Avoid the tight-on-tight look. 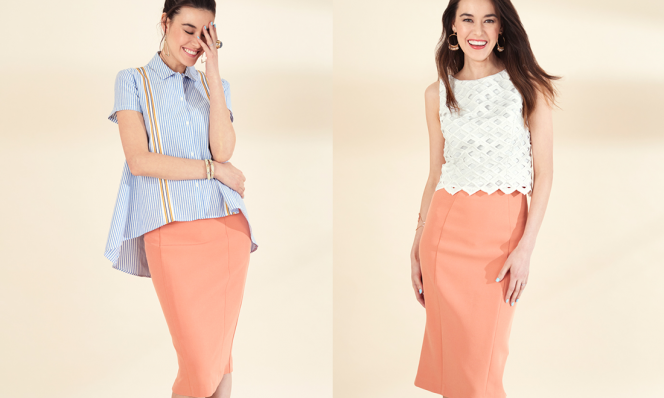 Wear a structured—but not form-fitting-—crop to balance the slim skirt. A jumpsuit is the edgier, more fashion-forward cousin of the sundress. You still show plenty of skin, but you’re covered up too. Plus, no need for shapewear when it’s a looser fit. Tip: The right jumpsuit will drape loosely around your lower half but cinch at the waist. Option 1 (left picture): Make your jumpsuit double as pants by pairing with a structured sweater. Choose one that hits just below your waist. Option 2 (right picture): Take your jumpsuit to work—just slip on a silky tailored blazer to make it office-ready. Lingerie-inspired pieces are huge this season. A tank in particular is super versatile. Option 1 (left picture): Put your silk camisole front and center- by layering it over a fitted top or bodysuit. Tip: While we love the subtle color combo here, you can also try a lingerie-inspired top in a contrasting color (like black or navy) to make a stronger statement. Option 2 (right picture): A cami under a button-front dress adds a hint of romance. Tip: If you need a little more coverage under a low-cut top or dress, a lacy tank will do the trick. 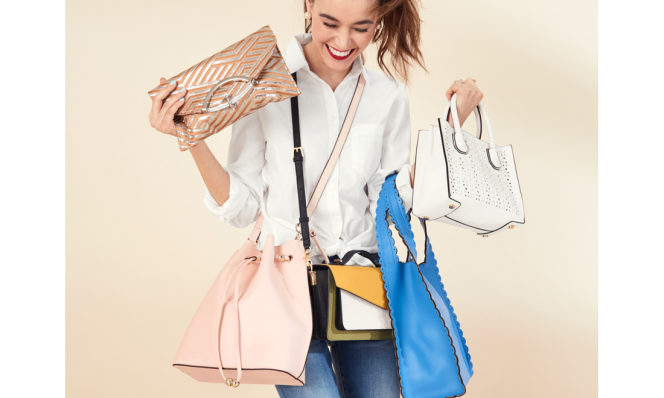 Refresh your spring wardrobe with a new handbag (or a few!) in different shapes and sizes. An evening essential, with a twist. Neutral and metallic stripes make it ideal for casual or fancy occasions. A top handle gives a bag a distinctly ladylike feel. And the laser-cut detail gives it a little edge. Fits all your daily necessities—and more. We love the scalloped trim. Stay hands-free when you’re on the go. Plus, the bold color blocking on this bag makes it the only accessory you’ll need. A perfect combo of structure and utility, and it’s super versatile—throw it over your shoulder or go crossbody. This pretty pink version can be monogrammed for free.